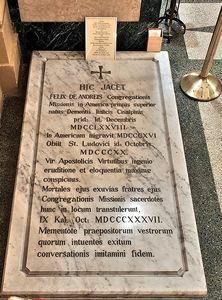 The marble tomb marks the burial site of the first Superior in America, Father Felix De Andreis, who brought his community of Vincentian priests, brothers, and seminarians from Italy in 1816, to the United States of America, arriving in Saint Louis in 1818. Under his direction Father Joseph Rosati, C.M. (later the first Bishop of Saint Louis) was sent with other Vincentian priests, brothers, and seminarians to start the new seminary as requested by Bishop Louis Du Bourg for the Louisiana Territory in Perryville, Missouri. This seminary became the first institution of higher learning west of the Mississippi River. Father De Andreis continued to reside at Saint Louis, fulfilling the multiple roll of Vicar-General of Upper Louisiana Territory, parish priest of Saint Louis, director of the diocesan seminary, and director of the Vincentian Novitiate, until his untimely death on October 15, 1820. The cause of his canonization has been introduced in Rome, thus we call him Venerable Felix De Andreis, C.M. Entombed beneath the wood floor are other Vincentian priests and clerics and a diocesan priest.